Are you an adventure junkie? Do you prefer getting off the beaten tarmac and heading to the unexplored? Is the loud, unadulterated exhaust note of a high revving engine music to your ears? In case you replied in affirmative to any/all of the above questions, there are good reasons for you to head to the nearest Polaris Experience Zone on the upcoming weekend. 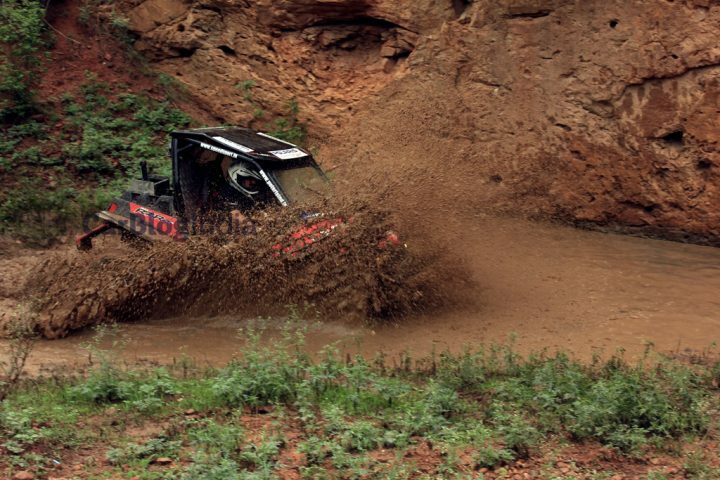 For the record, Polaris Experience Zones are specially planned areas where prospective buyers/enthusiasts can have a go in a range of Polaris All Terrain Vehicles (ATVs) and discover the off-road prowess of these machines. 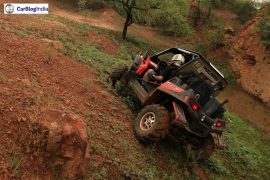 With a ‘right foot itch’ and high hopes of indulging in some sideways action, we recently spent an entire morning with two much loved ATVs from Polaris at a specially prepared location near Arjangarh Metro Station, New Delhi. 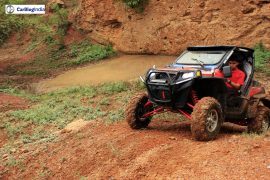 You may have a look at our Polaris RZR S800 and XP900 Review here for all the details of our rendezvous with these capable machines. 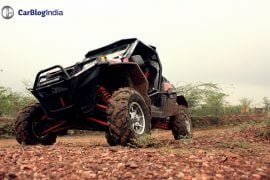 We tested the very capable Polaris RZR S800 and XP 900 four-wheeled ATVs and were left almost awestruck with the way these machines made short work of all kinds of rough terrain we subjected them to. 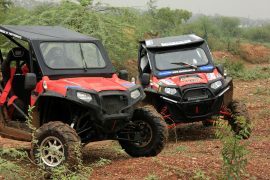 Both these machines have garnered a fan following among the off-road and adventure racing enthusiasts, and have proven their mettle in grueling performance sports such as the Raid De Himalaya. 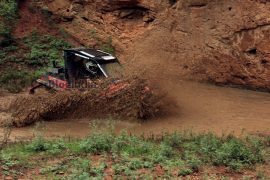 Powering the RZR S800 is a twin-cylinder, 800cc fuel injected engine that produces roughly 60 hp of maximum power. 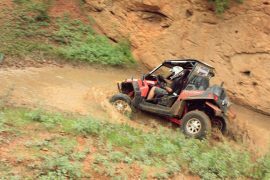 The RZR S800 benefits from light weight construction, which together with a free revving and a really peppy engine, enables this ATV to hit 35 mph from standstill in a little less than 4 seconds! A small wheelbase of just 77 inches, a high ground clearance of 12.5 inches, a low centre of gravity, and an all-wheel drive system together ensure that it’s a child’s play to deal with both the tightest of the corners and the sharpest of the undulations. We subjected both these vehicles to some articulations and even managed to cross a small pond, without as much as breaking a sweat. 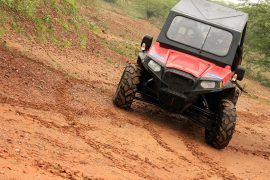 Quite obviously, the RZR XP900 is more powerful than the S800, and with a peak power of 88 bhp from its 900cc twin-pot motor, it gets all the easier to deal with all the challenges that the course threw at us. The XP900 also benefits from a higher ground clearance of 13.5″ and a 3-inch Long Trellis arm, which go on to make this ATV a tad more capable than its 800cc sibling. Both the vehicles come with a roll cage and 3-point safety belts to ensure occupant’s safety in an event of a mishap. Furthermore, the good chaps at Polaris Experience Zone have made it mandatory for all the occupants to wear a DOT-certified helmet and protective gloves, both of which are available at the PEZ itself. As you can see in the video above, these vehicles left us grinning like kids as we went sideways, intimidated all the humps, and zoomed through the water bodies. Both these vehicles feel like Go Karts that have been on a diet of steroids and offer a very direct steering that has the precision of a Swiss timepiece. As we said earlier, the engines are rorty and bestow the two ATVs with brisk acceleration and enough punch to tackle even the toughest of the terrains. The engines come mated to an automatic transmission that offer High and Low ratios. 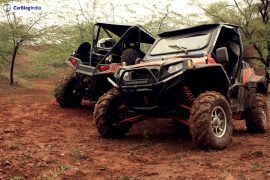 As you must have gauged by now, our short stint with these ATVs has left us impressed and we just can’t wait to have another go at ‘off-roading’. 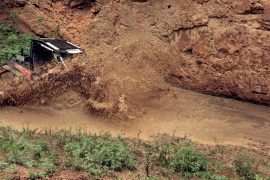 Also, we laud the efforts that Polaris has made to promote off roading, both as a lifestyle activity and a sport, in our country. 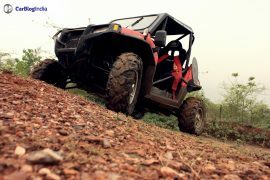 So, what do you think about our Polaris RZR S800 and XP900 Review? Do let us know by sharing your thoughts in the comments section below.